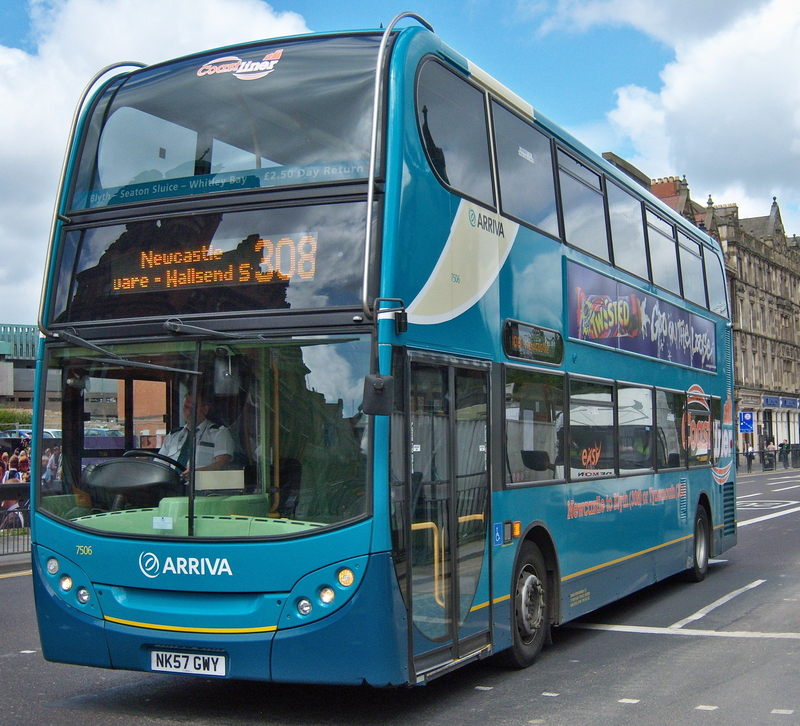 Arriva North East are making changes to services in Northumbria, Tyne & Wear areas from Sunday 6th September 2015. Service 2: Arriva are shortening this service to run between Blyth and Morpeth Bus Station, which will improve punctuality (especially at school start/finish times). New service X16 will provide an alternative link between Morpeth and Kirkhill. Buses will continue to run up to every 20 minutes on Monday to Saturday daytimes, but will not serve Red House Farm. This is also to improve punctuality as well as speed up journeys for the majority of customers. The 43 will offer an alternative link for Red House Farm, while the X21 already provides a frequent service along Ridge Terrace. Buses will run hourly in the evenings and on Sundays and will serve Red House Farm as now. Service 33: We are extending this service to run hourly from around 0730 to 1800 on Mondays to Fridays and from 0830 to 1800 on Saturdays. Through fares will also be available from Lancaster Park to Regent Centre and Newcastle, changing buses in Morpeth. Service 35/35A: There will be minor alterations to the timetable, including more buses on service 35A from Woodhorn and Newbiggin on Monday to Friday mornings. However, the Monday to Friday journey at 1757 from Morpeth to Woodhorn will finish in North Seaton due to low usage. Services 43, 44 and 45: The 43 will continue to run up to every 15 minutes on Monday to Saturday daytimes (half-hourly in the evening and on Sundays) between Newcastle and Cramlington. On Mondays to Saturdays, one bus per hour will extend to Morpeth via Shankhouse, Bedlington, Red House Farm, Nedderton Village and Hepscott Park. This will work alongside the 57 to give you two buses per hour between Cramlington and Bedlington. However, it will replace service 2 at Red House Farm and the 57A between Cramlington and Morpeth. Service 53: The Monday to Friday journeys that currently run via Cobalt will follow the normal route, omitting the business park. This is due to the increasing traffic congestion around Cobalt, which is causing buses to run late along the rest of the route. Some times are also being revised to improve punctuality. Service 54: This service will use Stand W instead of Stand X in the Newcastle Haymarket Bus Station. Most journeys will run 1-2 minutes earlier or later than now to improve punctuality. Service 55: Most Monday to Saturday daytime buses will run 1-2 minutes earlier or later than now to improve punctuality. Evening and Sunday buses will run up to five minutes later than now to give customers more time to get from work to the Newcastle Haymarket Bus Station. We are also introducing an earlier Sunday morning journey that will arrive in Newcastle City Centre before 1000. However, a small number of Saturday morning buses will be withdrawn due to low usage. Buses will use Stand X instead of Stand W in the Newcastle Haymarket Bus Station. Service 57/57A: The 57 and 57A will continue to provide two buses per hour on Monday to Saturday daytimes (one in the evening and on Sundays) between Whitley Bay, Monkseaton, Seaton Delaval and Cramlington. Most of the route between Whitley Bay and Seaton Delaval will be the same as now. The only change in this area will be in Whitley Bay, where buses will run via Norham Road instead of Park View and Marine Terrace to minimise journey times. On Monday to Saturday daytimes, the 57 (one bus per hour) will extend from Seaton Delaval to Ashington via the new Northumbria Hospital, High Pit, Cramlington, Nelson Industrial Estate, Bedlington, Guide Post and Stakeford. Buses will no longer serve Nelson Village or North Seaton. New service 58 will provide an alternative for Nelson Village, while the 35, 35A and X20 offer frequent links to North Seaton. The 57A (also one bus per hour on Monday to Saturday daytimes) will extend from Seaton Delaval to Cramlington via Seghill, Annitsford and High Pit. Buses will start/finish in Cramlington and will no longer continue to Beacon Hill and Morpeth. The new 58 will serve Beacon Hill while the 43 will provide an alternative link between Cramlington and Morpeth. Evening and Sunday buses will run as service 57A, maintaining links for Seghill and Annitsford at these times. They will also extend from Whitley Bay to North Shields via North Tyneside Hospital. Coastliner 306: There will be minor alterations to the timetable to improve punctuality, better match capacity with demand and reduce congestion in the Newcastle Haymarket Bus Station. Arriva are introducing more buses between Marden Estate, Preston Grange and Newcastle on Monday to Friday mornings to improve links for commuters. Also, on Mondays to Fridays, the last bus from Whitley Bay to Newcastle will be 1421 instead of 1351. Coastliner 308: This is becoming a very popular service, so buses will run up to every ten minutes between Blyth, Whitley Bay and Newcastle at Monday to Friday commuter times. We are also making some alterations to the Monday to Friday afternoon timetable to improve punctuality. Quorum Shuttle 555: We expect that the roadworks around Four Lane Ends and Quorum will be complete soon, reducing traffic congestion in this area. The 555 will therefore revert to running every 15 minutes at Monday to Friday commuter times. There will be minor alterations to the times of the 554 to fit with the 555. Services C1, C2 and C3 (New 58): Cramlington Local Services: The C1, C2 and C3 will be replaced by new service 58. At Monday to Friday peak times, buses will run up to every 30 minutes between Cramlington railway station, Cramlington town centre, High Pit and the new Northumbria Hospital. During the daytime and on Saturdays, buses will run up to hourly between East Hartford, Nelson Village, Beacon Hill, Cramlington town centre, High Pit, the Hospital, Seaton Delaval, Old Hartley and Hartley Square. The 58 will not serve Holywell and Northumberland County Council is looking at alternative arrangements for customers in this area. Service X4 (New X7): This service is being re-numbered X7, but will continue to run up to every 30 minutes on Monday to Saturday daytimes (hourly in the evening and on Sundays) between Newcastle, Quorum Business Park, Burradon, Seghill, Seaton Delaval, Seaton Sluice and Blyth. On Monday to Saturday daytimes, the X7 will connect with the X8 in Blyth so you can travel between places in the north and south of the town without changing buses. Through fares will be available. Monday to Friday peak-time buses will no longer run to the first roundabout inside Quorum to improve punctuality. Alternative stops are available outside the main entrance of the business park. The Monday to Friday journey at 0642 from Seaton Delaval to Blyth and the daily 2235 from Blyth to Seaton Delaval will be withdrawn due to low usage.